Yes, it has been a while, but I’m back! 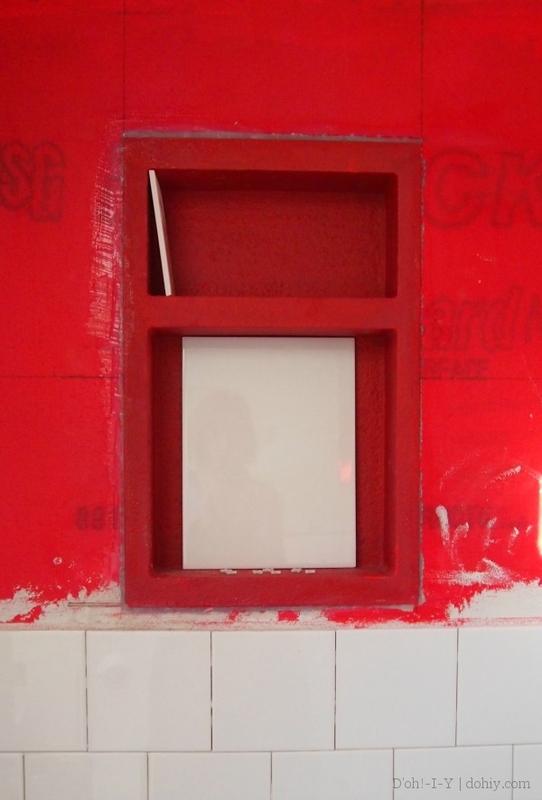 Part 1 ended with the niche secured flush with the shower wall and (hopefully) waterproofed. Next: tiling! 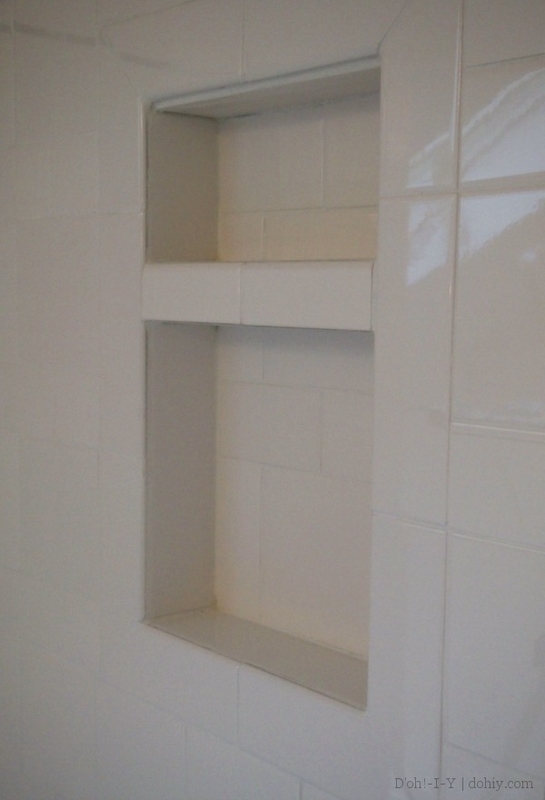 As discussed in Part 1, I installed the niche once I had the tiles up far enough to confirm how it should be placed to work with the tile pattern. 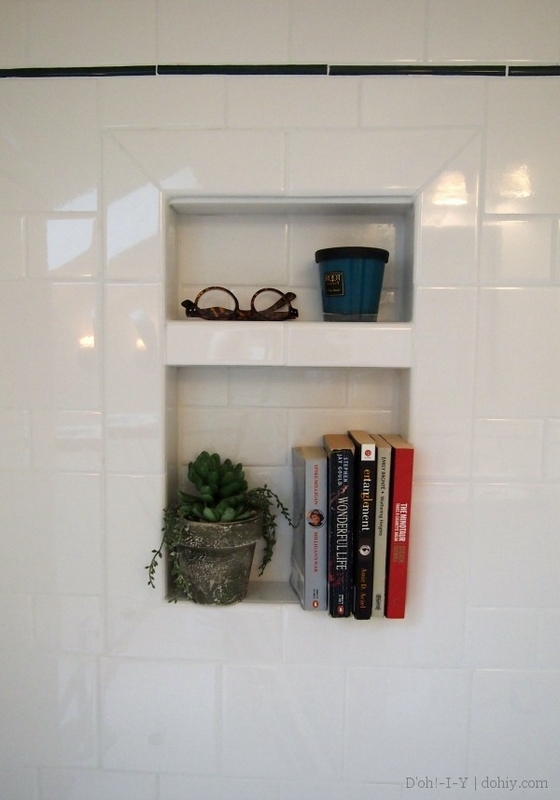 I used 3×6 subway tiles and 6×6 square tiles. These are plain white tiles from Menards. 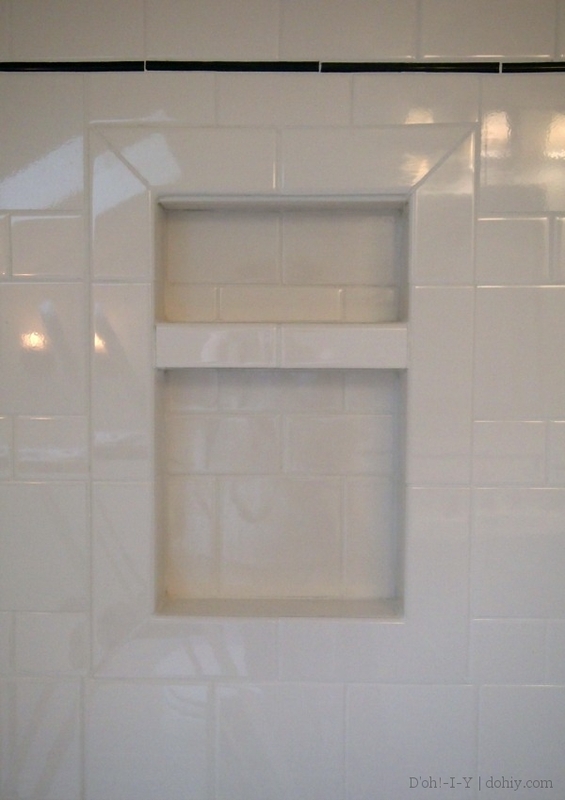 The available edging tiles included 3×9 bullnose pieces that I used to frame the niche. I kept everything divisible by three to help line everything up. I also had a stack of 9×12 tiles to cut down for the shelves, sides and tops of the niche (that’s one leaning against the back in the picture above). So I had all that and I was ready to go! If my measurements were right, then the 4×12 bullnose should span from the last tile course to level with the bottom shelf. First, I cut a piece of the 9×12 tile the size of the bottom shelf and mortared that in place. Then, I cut tiles from the corners of the shelf out 45 degrees. I did that several times, in fact. I continued the tile pattern from outside the nice on the back, but I lined the sides and flat surfaces with continuous pieces cut from the 9×12 tiles. Tiling inside the niche is no different from tiling a wall, only there are more corners. I ran the vertical tiles down so that they landed on top of (rather than behind) the horizontal tiles, on the theory that would decrease the possibility of water leakage through the back. I also added a little more mortar to the wall edge of the “shelf” tiles so that water would tend to run out of the niche, rather than puddling at the back — not enough to look un-flat, though. I’m led to believe that whenever there’s a turn in the tile, that seam should be caulked instead of grouted. Ergo, there were MANY caulk seams in the niche. I had the color-matched caulk for the TEC grout color I used (Standard White), but after it dried, it wasn’t all that great a match. When I was next grouting, I rubbed some grout into the caulk lines, and they came out great. 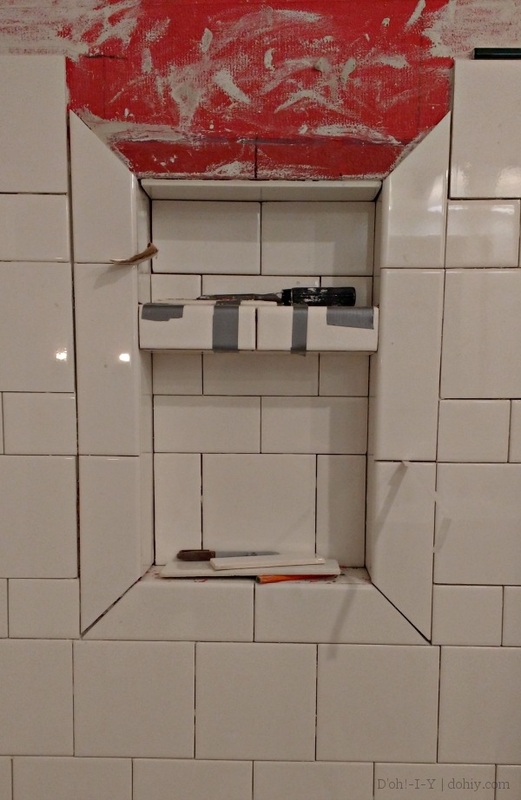 Now, I don’t know if that’s a legit use of grout (or caulk), so I’m not saying you should do that. I’m just saying I did that. And that it worked. Disregard the grout haze that I didn’t notice until now. I’m not totally thrilled with the top “ceiling” tile. Ideally, the top trim tile would come down further and hide the edge, but I’m not unthrilled enough to rip it out. Seriously, it’s a shower niche. Styling = shampoo and razors. But I might just stare at it being done for a few days first. 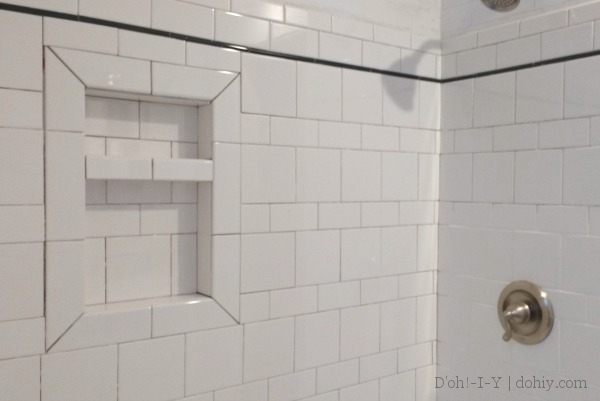 This entry was posted in Bathroom, Construction, Walls & Floors and tagged installing a shower niche, tiling a shower niche, tiling shower shelf, using preformed shower niche. Bookmark the permalink. This looks absolutely amazing!! Great work! I’m in awe of your skills. Also, that last “I styled it for you” picture made me laugh out loud. Came across your blog (somehow?!) from Houzz and I really enjoy your voice. Although I have an apartment, I harbor naive dreams of a fixer upper home in the future, and your work is really inspiring. Saludos from Chicago. Thanks, Jeanne (*waving toward Chicago*) — and thanks especially for liking my silly “I styled it” picture. By the way, having an apartment in Chicago (one of my favorite places) sounds pretty good to me! Fantastic DIY post for us challenged, yet somewhat confident (to much hgtv!) folks who talked their baby brother into replacing garden tub with a he-man shower!! I’ve been hesitant to start the shower walls and have yet to find base in the size he wants, 60×48 for a reasonable price. Still debating having one made, attempting base myself or hiring a hot-mopping company. I noticed you put vapor barrier inside base, on the lip as well as cement board. Did you just caulk or grout that space and start the tile? Would this work with a zero lip? Just curious. Love the niche….I’m adding that to my list as well as the selection of reading materials!!! My kind of shower! Hi, Carmen — The vapor barrier ends inside the base, and the cement board starts a little bit above the base, but inside the lip, then the tile overlaps the gap, leaving just a small gap that is closed with caulk. I don’t know whether a zero lip would work, but I also don’t know why it wouldn’t — just that all the resources said to leave a gap. Thanks for the nice comment, and sorry for taking so long to reply!